These Pop n Step toys feature a series of dancing characters on a music box! Enjoy the fun as you watch your favorite starters dance it off to different Pokemon theme music. Get more than one and connect them together to create a dancing army! These comical decals are ideal for One Piece fans who like to drive way too fast! With Luffy’s face is squished against the car window, these easy to apply decals will make it look as though you’re constantly putting the pedal to the metal. 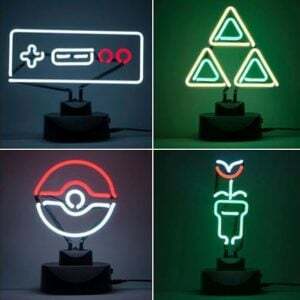 Light up your man cave or gaming room like an otaku should with one of these cool Nintendo neon lights! These stunning lamps create and effective yet ideal light source and ultimate home decor for any Nintendo fan.